Fratton Park is a football stadium in the English city-port of Portsmouth. It has been the home of professional club Portsmouth F.C. since its construction in 1898. The stadium has four all seated stands with a capacity for 21,100 supporters. The pitch, measuring 115 x 73 yards, is aligned from east to west. 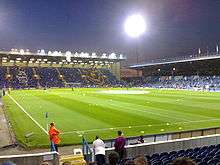 The largest and most modern stand is called the Fratton End, which was opened in 1997. The Fratton End is located at the western end of the Fratton Park stadium. Along either side of the pitch are the North and South stands, both of which are two-tiered. At the eastern end of the stadium is the smallest stand, the Milton End. Notably, the Milton End was the only roofless stand in the Premier League, before a roof was added before the 2007-08 season. The Milton End is used by visiting 'away' supporters. 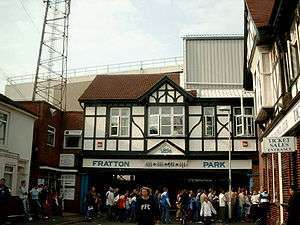 The original entrance to Fratton End is notable for its mock Tudor façade. Following the arrival of former owner Alexandre Gaydamak several renovations were made to Fratton Park, including improved dressing rooms, the above-mentioned roof over the Milton end and a big-screen above the police box in the corner between the North Stand and Milton End. The North Stand was refreshed for the 2010-11 season with renewed sponsorship by Mercedes-Benz car dealer Ridgeway which replaced the "Fratton Park Portsmouth" and the club crest. The stadium is served by Fratton railway station (about 10 minutes' walk away), which is located on the Portsmouth Direct Line. The main stand was designed by renowned football architect Archibald Leitch, whose company also built an ornate pavilion similar to Craven Cottage complete with clock tower. However, these were largely removed with the expansion of the ground. The first match at Fratton Park was a friendly against local rivals Southampton, which was won 2–0, with goals from Dan Cunliffe (formerly with Liverpool) and Harold Clarke (formerly with Everton). Fratton Park hosted a first-round football game in the 1948 Summer Olympics (one of only two grounds outside London, the other being the now disappeared Goldstone Ground). It hosted one full England international match on 2 March 1903 against Wales and has also hosted some England U-21 internationals. Pompey was the first club to stage a Football League match under floodlights, in a 22 February 1956 game against Newcastle United. New floodlight towers were constructed in 1962. It has held 51,385 for an FA Cup match against Derby County in 1949. The capacity has in recent years been much reduced by the introduction of compulsory seating. The ground has been home to the club throughout its entire history. The old stadium has been refurbished and repaired, but the current facilities are showing signs of age. By the time Portsmouth reached the FA Premier League in 2003, other clubs at this level had either built new stadiums or significantly redeveloped existing facilities along modern, less working-class lines, abolishing traditional features which have so far been preserved at Fratton Park, despite relocation being suggested as long ago as the early 1990s. When the Taylor Report of January 1990 required all clubs in the top two divisions to have all-seater stadiums by the 1994-95 season, relocation was soon being considered by the Portsmouth board, although Fratton Park was still converted into an all-seater stadium over the next few years, giving it a capacity of over 19,000. At the end of the 2003–04 season, the club having survived its first season in the Premier League, plans were developed to build a new stadium on the site of an adjacent disused rail-freight depot. These plans, which were supported by the city council, would also have allowed a much needed increase in ground capacity, but it was claimed that it would be impossible to achieve on the current footprint because of the close proximity of residential housing. Before work could begin, however, the plans were superseded by a new proposal to redevelop more or less on the existing site, but realigning the pitch 90 degrees to accommodate a larger capacity stadium, funded in part by a "Pompey Village" residential, hotel and retail project on the adjacent site. Work on the stadium was due to commence in the summer of 2006, and the first phase of the redevelopment completed a year later. Again, before work could begin, the plans were dropped, with yet another proposal announced on 25 April 2007 that would see a 36,000-seat stadium on reclaimed mud flats close to Portsmouth Naval Base. These plans were ambitious and included creating a leisure village around the stadium, complete with 1,500 waterfront apartments as well as restaurants and other facilities. The proposal for a new stadium was widely supported, although cautiously by many that were conscious that the waterfront location proposed in the outline plans would be surrounded on three sides, by the naval base, harbour itself and railway, thus leaving only one end for access by residents and supporters. Critics also pointed out that the mudflats the stadium was proposed to sit on was close to an area of Site of Special Scientific Interest, would be difficult to get to by road and had nowhere near the amount of car parking facilities needed for such an enterprise (Portsmouth is an island, with road access by only three routes from the north, and the waterfront site was close to the south-west extremity of the island). These plans were also dropped before work could begin. The club had undertaken consultation and there were a number of objectors to the proposal, no least about the problems that 36,000 fans would cause to the local travel infrastructure. The Royal Navy also said that the proposal would cause problems with the proposed introduction of its new super-size aircraft carriers. In 2008, a fourth set of plans were approved, to build a new 35,000 capacity stadium and leisure/residential complex on Horsea Island. In 2009 the Horsea Island development was put on hold due to financial issues. The previous proposal to rotate the existing pitch at Fratton Park by 90 degrees was re-instated. Work was due to begin late 2009, with a gradual increase in capacity until completion in 2010 ending with a capacity of 30,000. In 2011, plans to spend money redeveloping Fratton Park were announced, with improvements to changing rooms and toilets. By 2015, however, with Portsmouth in League Two (fourth tier of English football), no redevelopment or expansion work had yet taken place. As it stands, Fratton Park's current capacity would appear adequate until promotion to a higher division is achieved. Wikimedia Commons has media related to Fratton Park. ↑ Dave Juson & others (2004). Saints v Pompey – A history of unrelenting rivalry. Hagiology Publishing. p. 9. ISBN 0-9534474-5-6. ↑ "Pompey announce new stadium plan". BBC Sport. 25 April 2007. Retrieved 27 August 2007. ↑ "Fratton Park comes first as masterplan for stadium unveiled". The News (Portsmouth). 26 November 2008. Retrieved 31 August 2011. 1 2 "Pompey announce new stadium plan at Fratton Park". The News (Portsmouth). 19 March 2009. Retrieved 31 August 2011. ↑ "Fratton Park is set to hold 30,000 fans". The News (Portsmouth). 30 May 2009. Retrieved 15 June 2009. ↑ "Fratton Park to undergo revamp". The News (Portsmouth). 9 August 2011. Retrieved 31 August 2011. ↑ "Pompey's shining lights have given bright new future". The News (Portsmouth). 1 October 2015. Retrieved 8 August 2016.